Native credit unions, especially those that are certified as community development financial institutions (CDFIs), “offer the broadest array of products and services focused on the individual needs of low-income and underserved consumers,” according to Nikki Pieratos, project director at the Center for Indian Country Development. According to the Minneapolis Federal Reserve, there are 15 native-owned credit unions with total assets reaching nearly $300 million. Six of these credit unions qualify as CDFIs. Although there aren’t many native credit unions, they have been growing steadily over the last decade. Since 2010, three new Native American federal credit unions have opened their doors. Seneca Nation of Indians Federal Credit Union (chartered in 2015). Like other native-serving financial institutions, native credit unions provide vital services to local communities. One common benefit is that native serving financial institutions of all stripes, including banks and credit unions, reduce the number of people who are credit invisible (i.e. those without a credit score). Nevertheless, each type of financial institution offers different services. Piertos finds that native credit unions, especially those that are certified as CDFIs, offer the most services of any financial institution. 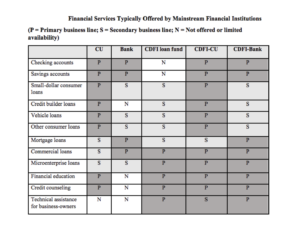 As you can see in the chart below, credit union CDFIs offer all financial services except mortgage loans (which is why it is so important to have a diverse group of native financial institutions serving local communities). Native credit unions also provide many of their services at a lower cost to customers than other financial institutions, partly because they have lower capital requirements and operational costs than their bank counterparts. The vast number of financial services that native credit unions offer at such low costs provide tremendous benefit to their customers.